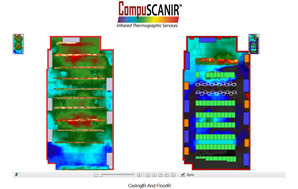 Zoomable Infrared Images provide a heat view look at the overall thermal performance of your facility. Thermal mapping can be used for commissioning new facilities, validating CFD modeling, troubleshooting a cooling problem and progressive monitoring in existing facilities. The large scale panoramas and mosaics provide a new context that traditional individual IR images cannot provide. By viewing the servers, floor, walls and ceilings in a data center from any angle, problems can be found and documented.